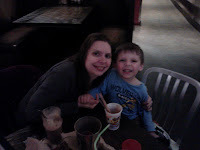 So tonight was set aside for Jude and I to have mommy and son date night. 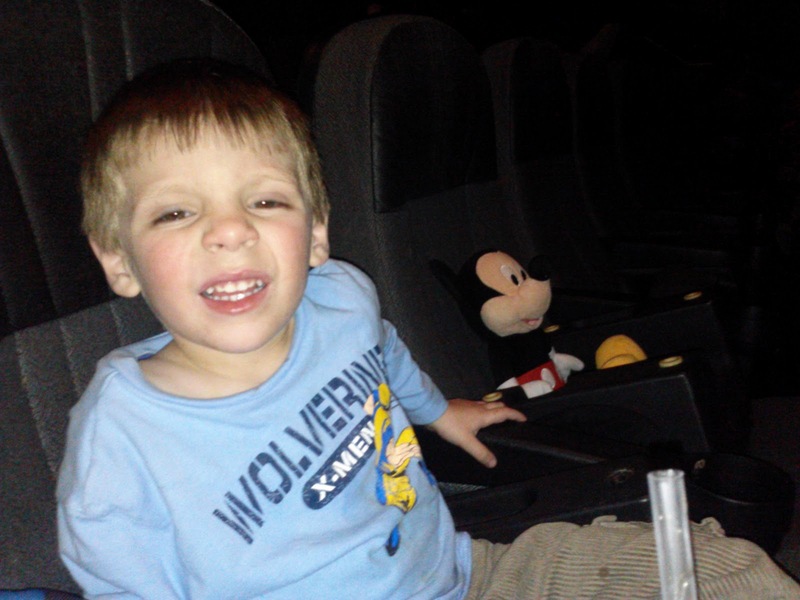 For only being 4 years old, Jude loves movies and loves movie theaters even more. He has no problem sitting through an entire movie usually smiling and giggling through the whole thing. It is so sweet to watch. So for tonight we decide on dinner at Michael Symon's B Spot followed by Escape from Planet Earth. I picked the restaurant Jude the movie. I must admit I was looking forward to dinner more than the movie but I was pleasantly surprised at how entertaining those crazy little aliens could be. So dinner at B Spot at Crocker Park was wonderful. It was Friday during lent so we had to skip the burgers and the vanilla bean apple pie bacon milkshake (it gives us a reason to come back). But we were not disappointed in our selection. Jude went with the kids grilled cheese and fries with a house made lemonade to wash it down. He was a little sad he couldn't order chicken fingers but when his meal arrived his disappointment turned to joy. I went with the grown-up version of grilled cheese which is made with fontina cheese, roasted red peppers and basil...Yum!Yum! I completed my meal with a side of Lola Fries and my go too diet cola. Well as I said Jude was pleasantly pleased when his meal arrived. He quickly realized his french fries tossed with kosher salt and my Lola Fries made with salt and rosemary were much different and that he had to eat most of my fries saying these are "goooood!!" For anyone wondering I asked for future reference, Lola Fries may be substituted for the kids fries with the children's meals. This is good to know if your child is a french fry connoisseur like Jude. I think Jude got more of his shake on his shirt than in his belly. So after a quick trip to the restroom to hose off and a brief distraction by as Jude called it the "awesome" blowing machine..ie the hand dryer we were ready to head off to the movies. Jude however had to stop to talk to the girls at the hostess stand to say "I like you!" I'm going to have to watch out for my little Casanova. So off to the movies. Despite our already overfilled bellies Jude insisted on a pretzel and root beer. We don't do this all that often and we all know I spoil my children (hopefully not to a fault) so I obliged. After getting our requisite accoutrements we were off to find our seats. Jude grabbed his booster seat for himself and one for Mickey Mouse. Oh yeah I forgot to mention we had a third wheel. We then found our seats in the theater. I had timed it pretty well so that the previews were just beginning. Jude loves all these as well. He has already planned our next three times out with what he saw. I think Despicable Me 2 is topping his list. 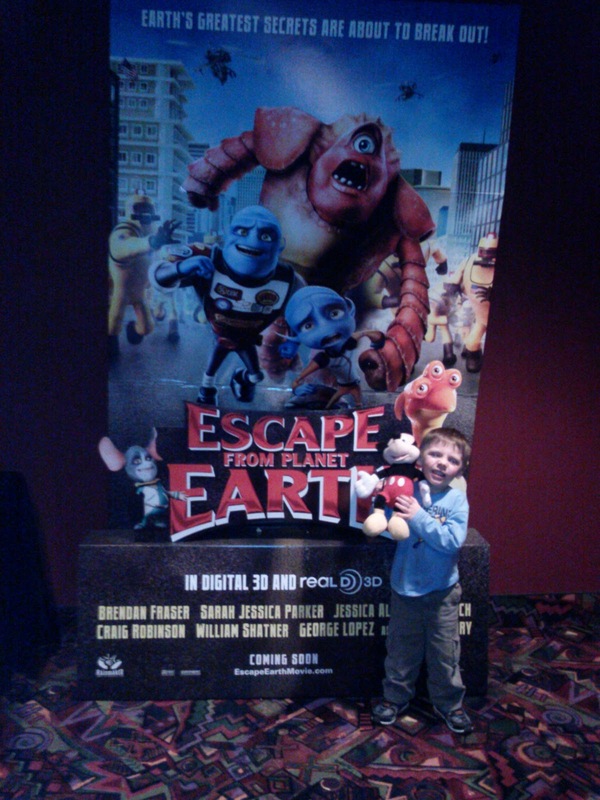 So I must admit I did not have high expectations for Escape from Planet Earth having seen its reviews. When I saw the previews it seemed to have all the stereotypical "kids" jokes. You know what I mean. It turned out to be entertaining even for adults. So this movie isn't going to win any awards for best animation, but it does have a heart felt message of the value of family and sticking together. The premise is two brothers Scorch the "cool & tough" younger brother and Gary the older "geeky" brother who is married to Kira with a young son, Kip, who idolizes his uncle. They live on the Planet Baab. Scorch is the hero that goes throughout the universe saving people while his brother Gary is the behind the scenes guy keeping his brother out of trouble. There is an SOS call from the Dark Planet (aka Earth) and before Gary can talk any sense into his brother, Scorch is off to save the day. Of course he is captured by the evil General in area 51. Well drama and mayhem ensue as the entire family comes to the rescue of Scorch. Along the way you meet several other unique aliens with high intellectual capabilities such as IO a one eyed giant red alien with anger management issues from the Sun and Doc a rat like alien reported to be a talk show therapist. Well through twists and turns you learn the valuable lesson of family and friends. There are some funny moments that even adults will be caught laughing out loud at. Now I know the reviews say this movie is nothing to write home about. This would be true. This one won't make this list of all time best animated movies, but it is a family friendly movie with cute characters that will have you giggling along the way. And for mommy and son date night you can't ask for much more than that. What a great time I had with my son. I know I need to treasure every moment I get like this because one day I won't be the only women in his life. But hopefully I will always be the "best mommy ever" in his eyes. And if I am, that's all I need!!! So sweet :) Excellent food choices. Tee hee.... Awesome blowing machine.